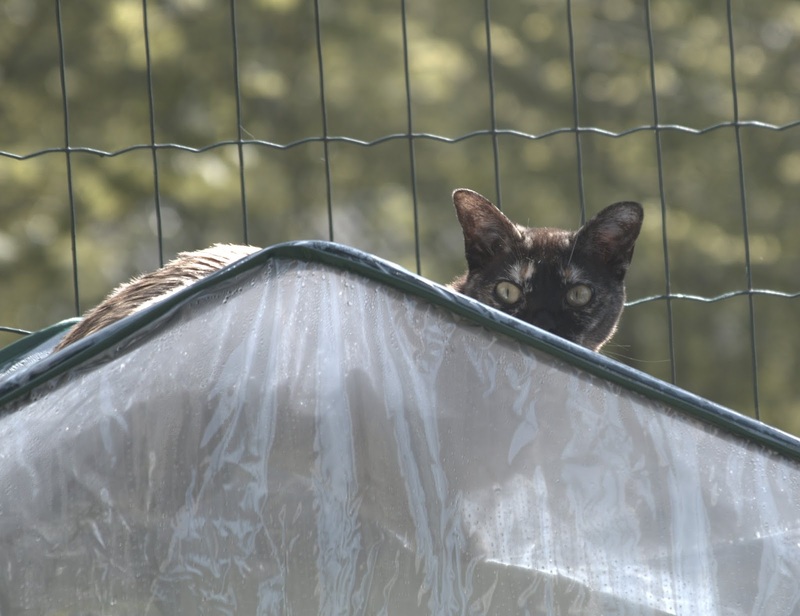 Mesi attempts to hide on the cheap 'greenhouse' thingy Äiti is using to protect her chilli peppers. We just hope Mirsku doesn't join her as it won't hold his weight, hehehehe. She looks so cute up there! I can just imagine it all coming down with a crash if Mirsku tried getting up there. We bet it's all nice and warms up there...a petite heater! Being a minicat has its rewards! Prudence is very petite (even if she is smacking away at the food dish as I type this) and often goes where the others cannot. Enjoy your purrsonal space, Mesi! But then again - why should Äiti's pepper thing continue being protected? Mirsku = crushed chilli peppers. Did you get them from Fatalii?